Description: Black & white photo postcard of the Congregational Church, Windsor, CT, now known as the First Church in Windsor. This church building on Palisado Avenue was erected in 1794. The meetinghouse is the fourth church home for this congregation. 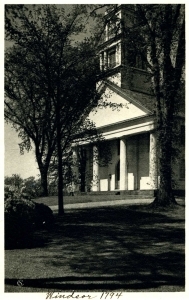 The postcard was issued as one of a series called “The American Scene: Early Meetinghouses” published for the State of Connecticut Tercentenary in 1935.